A remarkable woman once walked through the poorest sections of Dublin City saddened and stunned by what she found there—ignorance, neglect, and disease. She was appalled by the all too visible helpless hunger and hopeless prejudice. The poor had overwhelming needs, as the poor always do. These Irish poor had no way out, caught as they were in a bitter struggle of political-religious ideas and ideals that denied them food, freedom, property and education. This woman knew there was something she had to do; she comforted, she prayed, she instructed, she consoled; she returned again and again. Finally she started an institute of women religious who could bring to those in need the incomparable quality of God's mercy. Who was this woman of compassion and prayer? Socialite turned social worker, lady of fashion who lived among the poor, woman of wealth who had no money, activist who early learned the discipline of sanctity. Her name was Catherine McAuley; her institute is the Religious Sisters of Mercy, started in 1831 with only seven co-workers. In nineteenth century Dublin, which Catherine labeled "one scene of wretchedness and sorrow," poverty and ignorance appeared to be taken for granted. Distressed by the misery of the poor, she was one of a few extraordinary women who began to care for those for whom, to all appearances, no one else seemed to care. Although they were permitted, according to their rule, to take in those seeking an education, the Presentation Sisters and the Irish Sisters of Charity observed the rule of cloister and did not go through the city to work there among the poor. Catherine McAuley, who had studied the accomplishments of both Nano Nagle and Mark Aikenhead, knew first-hand the very real problems of the deprived in Dublin because she had seen where and how they lived. She had an idea of what could be done and set out earnestly to try to do it. And it was she, who in the providence of God, was able to use her social position and inherited wealth to help the needy who wandered the city streets. As founder of an Irish religious order, Catherine might be thought unlikely to succeed, largely because a religious institute was never really her intent at all. She was approximately 50 years old when the Institute of the Sisters of Mercy was established; she lived only 10 years after that uncertain beginning; and she found out very quickly that what she had thought a vast amount of inherited wealth—close to one million dollars in twentieth century currency—was pitifully inadequate for the needs of those who cried out for help. Not all the money in Dublin could have relieved the social ills apparent everywhere. Those she saw in need were not only numerous, but they seemed daily to multiply. Ireland was in turmoil; bitter, deep and divided. Dublin was split into religious, economic and socio-political categories unalterably opposed to each other: Catholic-Protestant, poor-rich, and underprivileged-influential. The divisions were rooted in the late seventeenth century defeat of Catholic forces by Protestant troops loyal to the English monarch. What followed is known in Irish history as the "Penal Code," a legislative attempt to impose another church, another economic and political order. By 1730 the opening of government Charter Schools, in opposition to the few new "Charity" schools, was looked upon by Catholics as a concerted drive to proselytize their children. Gradually, though not without first causing great suffering, post-Penal Laws had begun to ease some of the restriction in six schools. By 1811, when the Protestant Kilare Place Society began educating hundreds of children in Dublin, it was evident that more sources of Catholic education were imperative if the faith was to survive. 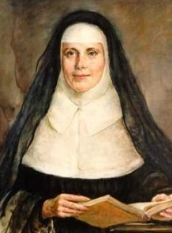 Catherine McAuley's perception of the situation was clear, her purpose formed. Her procedures, though she thought them her own, were taking shape in God's hands. Her gifts of charm and courage, wit and wisdom supplemented her wealth in carrying out her vision of service. Many years later Dr. Michael Blake, Bishop of Dromore, was to say to say of her in a letter to Pope Leo XII, "She seems raised up to bring about some great work for the Church."